Published before the beginning of the "Socializing of America" in 1933, it is the best and most edifying rendition of our Foundation Document that I have found to clarify the intent of the Founders and the understanding of "We the People", the Sovereign Citizens of the United States of America. In this HTML Edition the Text of the Constitution is presented one phrase at a time, immediately followed by the history and reasons for the inclusion of that particular phrase in the Constitution, with reference links to other pertinent data contained elsewhere in the text. My Appreciation to RHC and to RLG, Patriots and Sovereign Citizens, for their encouragement and assistance and to "Pop", Dean Lewis Hardison, who taught me the importance of our Constitution. We the People of the United States, menaced for the past 100 years by collectivist trends, must seek Revival of Our Strength by re-Educating Ourselves in the Spiritual Foundations, Principles and Ideals which are the bedrock of our Republic, the Principle and Conviction of the Sacredness of every Human Life, and in the understanding of Our Responsibilities in the care and maintenance of those Foundations. To that end is this HTML Edition presented. "The establishment of our institutions," wrote President Monroe, "forms the most important epoch that history hath recorded. They extend unexampled felicity to the whole body of our fellow-citizens, and are the admiration of other nations. To preserve and hand them down in their utmost purity to the remotest ages will require the existence and practice of virtues and talents equal to those which were displayed in acquiring them. It is ardently hoped and confidently believed that these will not be wanting." 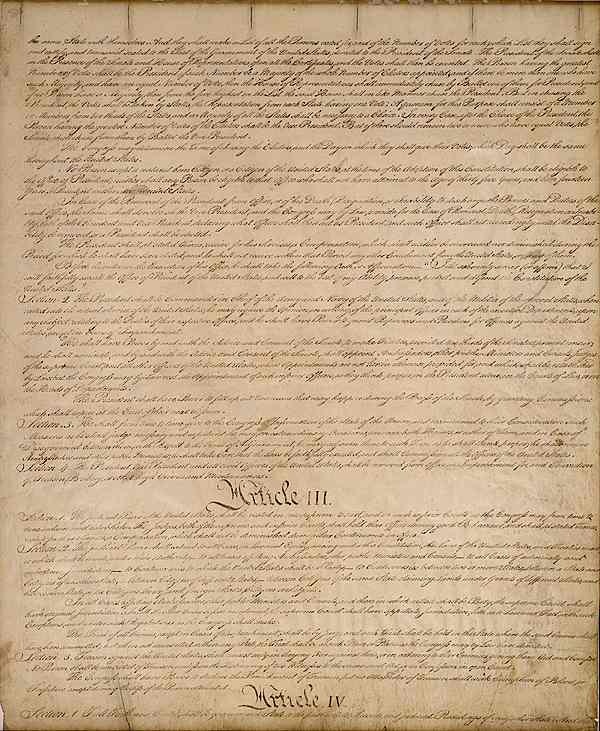 In this era of world-wide social and political change, it behooves us, as never before, to know the fundamentals of our Constitution which, in times of stress as well as in peace, has provided the American people with a more enduring and practical government, and a greater degree of prosperity that any other people have ever had. It is well to remember the words of James Madison as we search for Truth in Self-Government and in Our Understanding of this Great Document of Liberty, Freedom, Justice and Prosperity. "In proportion as the structure of a government gives force to public opinion," wrote Washington in his Farewell Address, "it is essential that public opinion should be enlightened." Therefore, the purpose of this presentation is to make accessible to every citizen and his posterity such knowledge of the Constitution For The United States as will serve him well, in peace or war. But the means of acquiring the information essential to stalwart citizenship has never before been available to the mass of people in as practical and simple form as this presentation on the internet. "Almost every provision in that instrument [The Constitution]," said a great jurist, " has a history that must be understood before the brief and sententious language employed can be comprehended in the relations its authors intended." The simple plan of this presentation is to explain the Constitution by a note to every line or clause that has a story or drama from history back of it, or that has contributed during the years of our life under this document to the welfare of mankind. This method leaves the test of the Constitution and the Amendments in unbroken connection, so that the whole design is plainly seen as the explanation appears immediately under the part to be explained. In addition to showing the historic sources of particular provisions of the Constitution examples are also given to the application of the clauses in great matters which have arisen during our nation's life. These decisions of the courts are brought down to the present day. They illustrate very clearly that the man in power has undergone no change and that without the prohibitions of the Constitution and the means of giving them immediate effect he would become as dangerous as he ever was to the safety of the government and to the rights and liberties of the people. One who reads and studies closely the full explanation in the text will discover that each clause or word in the Constitution was carefully designed to protect the individual -- his life, his liberty and his property. By a few, the erroneous belief has been spread that the Constitution is a barrier in the way of American progress. Actually the Constitution is a coat of mail which man himself has fashioned for his own protection, and which he has changed from time to time that the protection might be the more complete -- protection against the abuse of power by his servants in the legislature or Congress, whom he may dismiss at election time or by impeachment, and against whose invasion of his rights he can appeal to the courts; against his executive officers, whom he may dismiss by impeachment or ballot; against his judges, whom he may remove for lack of "good behavior." His government is not his master, as the king or dictator has always been, but his servant." "In questions of power then," wrote Jefferson, "let no more be heard of confidence in man, but bind him down from mischief by the chains of the Constitution." The Founders of the Republic feared parties of the people as much as they did a royal government. "Whenever there is an interest and power to do wrong," wrote Madison to Jefferson in 1788, "wrong will generally be done, and not less readily by a powerful and interested party than by a powerful and interested prince." The notes which are to follow will disclose the truth of that statement. See Also "Undermining the Constitution - A History of Lawless Government"
There is no more interesting fact to be learned about our Constitution than that of its influence upon the nations of the world. While Americcans know in a general way that under their Constitution thirteen scattered agricultural communities have developed into a nation of fifty states of the most varied resources, with the highest social and educational advantages, they are not aware that our Constitution has been copied in whole or in part throughout the earth. "The Republic of the United States," states Lord Bryce, Ambassador Extraordinary and Plenipotentiary at Washington from Great Britain from 1907 to 1913, author of "The American Commonwealth" (1888) and professor of civil (Roman) law in the University of Oxford from 1870 to 1893, writing ("Studies in History and Jurisprudence", Vol. 1, p.168) of what he called a "rigid" constitution -- one like ours, which can be changed only by a method different from that whereby other laws are enacted or repealed -- "has not only presented the most remarkable instance of this type in the modern world, but has by its success become a pattern which other republics have imitated. . . . The constitutions of all the forty-five [now 50] States of the Union are rigid, being not alterable by the legislatures of those States respectively. This is also true of the Constitution of the Dominion of Canada, which is alterable only by the Imperial Parliament. Mexico and the five republics of Central America, together with the nine republics of South America, have all adapted constitutions which their legislatures have not received power to change." The Commonwealth of Australia adopted a constitution (1900) following ours more closely even that that of Canada (1867) did; and in 1909, after the Boer War, the Union of South Africa adopted a similar constitution, but owing to the diversity of the races and interests which were united, it does not follow the American model so closely as do those of Canada and Australia. France, Belgium, and Switzerland have put in their constitutions many provisions first employed in ours; but to the extent that other countries have failed to follow the Constitution of the United States their governmental structures are weak, as the study of the notes will reveal. It is to be seen, further, that the underlying principles of our Constitution were not formulated in a day. When our forefathers declared their independence some of the colonists had lived under written charters from the English Crown for one hundred sixty-nine years, or three-fourths as long as the years we have lived under the present Constitution. During that long term many of the Colonies were practically self-governed. The English historian Lecky ("England in the Eighteenth Century") says that all of them enjoyed greater privileges in this respect than did the English people themselves. It will be seen from a study of the notes that many leading principles of the Constitution were adoptions or adaptions of what the colonists had worked out in experience while they were subjects of the English government; and that after the Declaration of Independence the States framed constitutions of their own from which many important provisions were borrowed by the Constitutional Convention and made a part of our fundamental law. Many other provisions of our Constitution merely state principles of English law as the colonists thought that they should be applied in the new day. "In the government of this commonwealth the legislative department shall never exercise the executive and judicial powers, or either of them; the executive shall never exercise the legislative and judicial powers, or either of them; the judicial shall never exercise the legislative and executive powers, or either of them -- to the end that it may be a government of laws and not of men." Nearly a year before the Constitutional Convention sat James Madison began working out what was called "the Virginia plan" of a form of government. Charles Pinckney of South Carolina took with him to the Convention a carefully drafted plan. Alexander Hamilton of New York had drawn such an elaborate scheme of government "that," says Taylor ("Origin and Growth of the American Constitution"), "it might have gone into effect the next day if it had been adopted." Other plans and suggestions almost without number were presented to the Convention. Taylor says that the three plans mentioned were the real basis of the Convention's work, that they were restatements of principles contained in a document published in Philadelphia by Pelatiah Webster in 1783. In addition to this careful preparation after more than a century of self-government, there were in the Convention men of extraordinary natural ability and wide experience, like Washington, Franklin, Hamilton and Madison. There were men who had studied law at the Inner Temple in London, who had been educated in the University of Edinburgh, who had been graduated from American colleges, who had been governors of States, chief justices of supreme courts, and men who had achieved distinction at the bar and in business life. Edmund Burke stated in the House of Commons in March 1776, that more books of law were going to America than of any other kind. Of the fifty-five members of the Constitutional Convention, thirty-one were lawyers. Blackstone's Commentaries were taught by Chancellor Wythe in William and Mary College before the Declaration of Independence. John Marshall, Thomas Jefferson, and James Monroe were among his pupils. When our Constitution was written Harvard College (1636) had been sending out educated young men for just a century and a half, William and Mary College (1693) had been graduating learned youths for almost a century, Yale College (1701) had been contributing to the education of the people for more than three quarters of a century, and Princeton (1746) had been teaching for half a century. The people were well prepared for their great endeavor. The task of the Constitutional Convention was not to construct a government from the foundation up. There had already been firmly set by experience thirteen base-stones in the form of State republican governments. Upon these, and for the benefit of their population as a whole, the National structure was placed. This supergovernment was to deal with foreign nations, and also to administer at home all matters of National (as distinguished from State or local) character. The National government was to be supreme in its domain, and the State governments were to be sovereign in all affairs not National or foreign. As will be seen, this duality, while conducing to a happy balancing of governmental powers, has at the same time been the strongest force in political and material advancement. For the Nation has learned from the States, as they have learned from one another and from the Nation. Many changes have been brought about by the action of States which might never have resulted were action by the whole people called for in the first place. Of the numerous illustrations which might be given of the effect of State action upon National opinion perhaps the best is found in the laws (local option or prohibitory) restricting the manufacture and sale of intoxicating liquors. Without precedent action and demonstration by the States the Eighteenth Amendment would not been adopted. This observation may be repeated as womanhood suffrage, the trial of which in many States led to the Nineteenth Amendment. In many ways the competition of the States has been vitalizing and progressive. It is a question whether a vast republic not having such political subdivisions could long stand. It is not generally mentioned that our present fundamental law is the second written form of government of the United States. The first was called the Articles of Confederation. 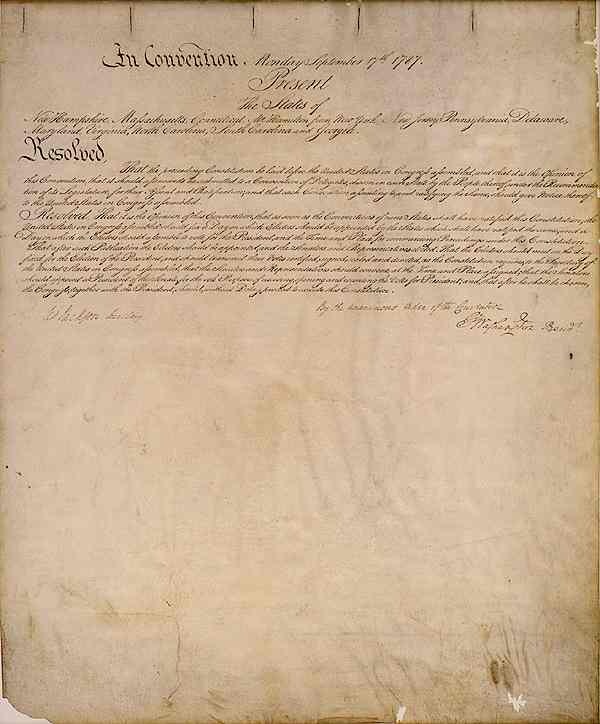 The Articles went into effect as a government of "the United States of America" in 1781.. 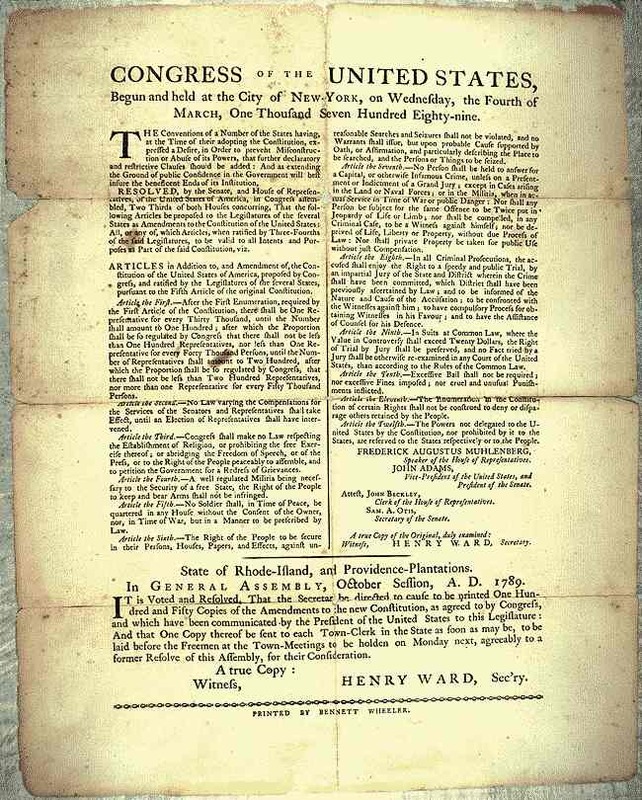 In 1777, less than a year after the Declaration of Independence, the Articles which had been drafted were adopted by the Convention chosen by the Continental Congress 1 to frame them. But owing mostly to disputes regarding western lands (the royal grants to the Colonies reaching westward indefinitely), the last State did not give its ratification until 1781. The Articles were so inadequate that within four years plans originated at Mount Vernon to remodel them. Washington and a company of statesmen recommended the calling of a convention the next year (1786) at Annapolis. Only five States sent representatives and, therefore, the Convention adjourned to the next year at Philadelphia. AII the States except Rhode Isand were then present by representatives. Washington, a delegate from Virginia, was chosen to preside. "Let us raise a standard to which the wise and honest can repair," he said; "the event is in the hand of God." The Convention, which was called to remodel the Articles of Confederation, cast them aside and drafted an entirely new instrument. Pains have been taken in the notes to state everything simply and clearly, and as fully as the restricted space would permit. It is recommended that the General Index, the Landmark Court Case Index and the Constitutional History of this presentation receive diligent study, and that as a matter of review, the Constitutional Quiz be taken. For historical value the dates of the great decisions and of the leading acts of Congress have been given. Citations of volumes and pages have been omitted because they are not followed up by the run of readers and they are unpleasant to most eyes. But for the help of lawyers, and others who may wish to go beyond the text, a short table of the leading cases is presented. Acknowledgment is due to Mr. Gardiner Lathrop of the Chicago Bar, to Mr. William DeForest Manice of the Bar of New York City, and to Mr. Blackburn Esterline of the Bar of the City of Washington for very helpful readings of the manuscript. As stated at the outset, this explanation of the Constitution has been prepared under the conviction that the American never has had within reach the means of acquiring that knowledge which, as a citizen, he should first of all possess. Note 1. The Continental Congress was the provisional or emergency government which was made up of delegates from the several States and which acted as their united authority from the time that the dispute with the English Government assumed its most serious aspect (1774) until the Articles of Confederation went into effect in 1781. "In addition to the very important charge of managing the war," said President Monroe, discussing the Continental Congress, "that Congress had under consideration at the same time the declaration of independence, the adoption of a confederation for the States, and the propriety of instituting State governments, with the nature of those governments, respecting which it had been consulted by conventions of several of the Colonies. So great a trust was never reposed before in a body thus constituted." "The question whether an act repugnant to the constitution can become the law of the land is a question deeply interesting to the United States; but, happily, not of an intricacy proportioned to its interest. It seems only necessary to recognize certain principles, supposed to have been long and well established, to decide it. "This original and supreme will organizes the government, and assigns to different departments their respective powers. It may either stop here, or establish certain limits not to be transcended by those departments. "The government of the United States is of the latter description. The powers of the legislature are defined and limited; and that those limits may not be mistaken, or forgotten, the constitution is written. To what purpose are powers limited, and to what purpose is that limitation committed to writing, if these limits may, at any time, be passed by those intended to be restrained? "If an act of the legislature, repugnant to the constitution, is void, does it, notwithstanding its invalidity, bind the courts, and oblige them to give it effect? Or, in other words, though it be not law, does it constitute a rule as operative as if it was a law? This would be to overthrow in fact what was established in theory; and would seem, at first view, an absurdity too gross to be insisted on." -- Chief Justice Marshall. "This Constitution defines the extent of the powers of the general government. If the general legislature [Congress should at any time overleap their limits the judicial department is a constitutional check. If the United States go beyond their powers, if they make a law which the Constitution does not authorize, it is void; and the judicial power, the National judges, who, to secure their impartiality, are to be made independent, will declare it to be void. On the other hand, if the States go beyond their limits, if they make a law which is a usurpation upon the Federal [National] government the law is void; and upright, independent judges will declare it to be so." So there has been no usurpation of this power. In so many instances, fueled by greed, avarice, and self-aggrandizement, Our Elected Servants have subverted the Principles of the Constitution and Its strictures on the limitation of Government. "Time has proven the discernment of our ancestors; for even these provisions, expressed in such plain English words that it would seem the ingenuity of man could not evade them, are now after the lapse of more than seventy years, sought to be avoided. Those great and good men foresaw that troublous times would arise, when rulers and people would become restive under restraint, and seek by sharp and decisive measures to accomplish ends deemed just and proper, and that the principles of constitutional liberty would be in peril unless established by irrepealable law. The history of the world had taught them that what was done in the past might be attempted in the future. "Because if . . . [An Unalienable Natural Right of Free Men] . . . be exempt from the authority of the Society at large, still less can it be subject to that of the Legislative Body. The latter are but the creatures and vicegerents of the former. Their jurisdiction is both derivative and limited: It is limited with regard to the coordinate departments, more necessarily is it limited with regard to the constituents. The preservation of a free Government requires, not merely, that the metes and bounds which separate each department of power be invariably maintained: but more especially that neither of them be suffered to overleap the greater Barrier which defends the rights of the people. The Rulers who are guilty of such an encroachment, exceed the commission from which they derive their authority, and are Tyrants. The people who submit to it are governed by laws made neither by themselves nor by an authority derived from them, and are Slaves -- James Madison, June 1785. The Great Barrier to the Alienation of the Unalienable Natural Rights of All Free Men, and the Metes and Bounds of the Government of the United States, is the Constitution for the United States. "We the People" and OUR Elected Representatives MUST adhere to Principle, ALWAYS Placing Principles Before Personalities, Educating Ourselves to the Truth. To save our Republic, all Americans must unite!! "The last hope of human liberty in this world rests on us. . . . If we move in mass, be it ever so circuitously, we shall attain our object; but if we break into squads, every one pursuing the path he thinks most direct, we become an easy conquest to those who can now barely hold us in check. For two centuries of unexampled social, civil, and material advancement, in which it has been the controlling force, the Constitution has applied itself, adapted itself, developed itself, amended itself, and, through the stress and shock of civil and foreign wars the like of which no other constitution ever felt, it has maintained its equilibrium. The American citizen has reason to believe that his fundamental law contains inherently what the Scriptures call "the power of an endless life." As the Nation enters the new Millennium the only danger seen is that which has always plagued nations, dishonest power hungry influence peddling politicians and bureaucrats whose influence is bought by the special interests,dishonest men who have, with impunity, forgotten they have taken a Sacred Oath to Defend the Constitution and the Nation against ALL enemies, Foreign and Domestic. 1 It is important to notice that this is a government of the people, not of the States. 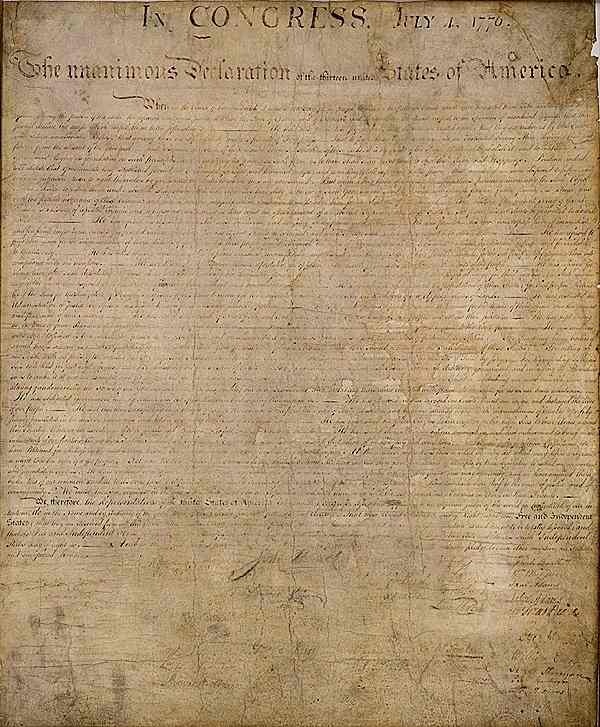 Under the Articles of Confederation, in effect as our first form of "national" government, agreed to by the Continental Congress on November 15,1777 and in force after ratification by Maryland on March 1, 1782 until the ratification of the Constitution for the United States in 1788 and George Washington's inauguration as the nation's first President under the Constitution on April 30, 1789, the States as political entities, and not the people, entered into "a firm league of friendship", each State retaining "its sovereignty, freedom and independence." 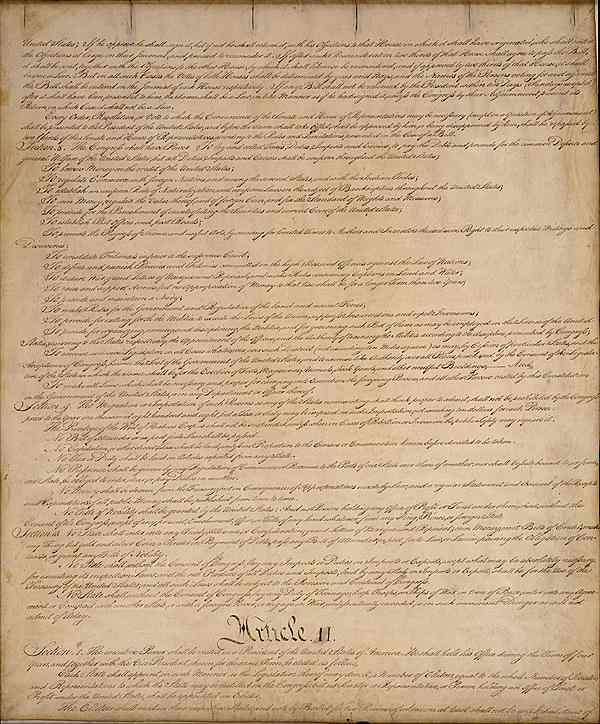 The new Constitution for the United States brought in a new Nation, the United States of America, deriving its "just powers from the consent of the governed." "The people, the highest authority known to our system," said President Monroe, "from whom all our institutions spring and whom they depend, formed it." "Its language, 'We the People,' is the institution of one great consolidated National government of the people of all the States, instead of a government by compact with the States for its agents," exclaimed Patrick Henry in the Virginia ratifying assembly while leading opposition to its adoption, "The people gave the [Constitutional] Convention no power to use their name." Some States restricted the authority of their delegates to revising the Articles of Confederation. It was claimed that the casting aside of the Articles of Confederation (which could be altered or amended only by the concurrence of every State) for a constitution to become effective when adopted by nine of the thirteen States was revolutionary. It was, in fact, a coup d'Etat. Revision only was uppermost in the minds of many. 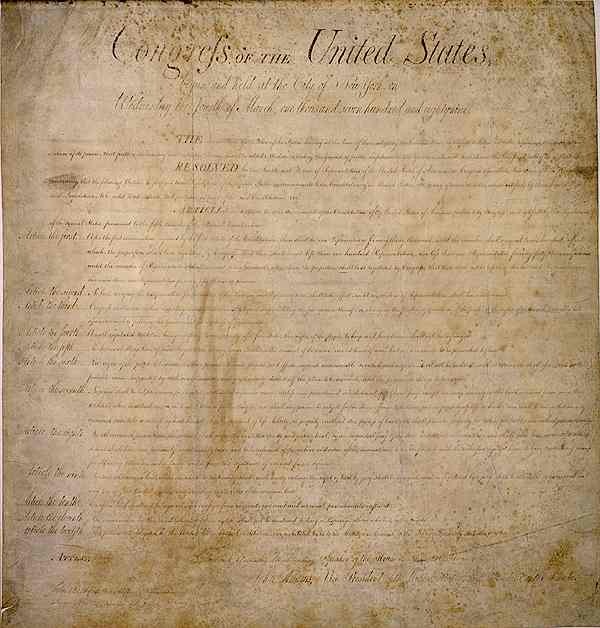 On February 21, 1787, the Congress existing under the Articles called a convention "for the sole and express purpose of revising the Articles of Confederation and reporting to Congress and the several legislatures such alterations and provisions therein as shall, when agreed to in Congress and confirmed by the States, render the federal Constitution adequate to the exigencies of government and the preservation of the Union." But it was the belief of the Constitutional Convention that as the new instrument was to go to the people for ratification or rejection, the objections stated by Henry and others were really unimportant. 2 Meaning "a more perfect union" than had been achieved by the Articles of Confederation. "In the efficacy and permanency of your Union," wrote Washington in his Farewell Address, "a government for the whole is indispensable. . . . Sensible of this momentous truth you have improved upon your first essay [the Articles of Confederation] by the adoption of a Constitution of government better calculated than your former for an intimate Union and for the efficacious management of your common concerns." The Union, made "more perfect" by the Constitution was nevertheless in later times said to be dissoluble at the pleasure of any State that might wish to secede. In his Farewell Address (1796) Washington had called upon the people "indignantly" to frown "upon the first dawning of every attempt to alienate any portion of our country from the rest or to enfeeble the sacred ties which now link together the various parts." To put the question beyond controversy it required a four year Civil War, after the secession of the southern States, beginning with that of South Carolina in December, 1860, following the election of Abraham Lincoln to the Presidency in the preceding month. "The States have their status in the Union, and they have no other legal status. If they break from this, they can only do so against law and by revolution. The Union [of the original thirteen independent states under the Articles of Confederation], and not they themselves procured their independence and their liberty. By conquest or purchase the Union gave each of them whatever of independence and liberty it has. The Union is older than any of the States, [other than the original thirteen independent states under the Articles of Confederation] and in fact, it created them as States." The citizen was not, under the theory of States' Rights, in contact with the National Government. He owed allegiance to his State, and the State, in turn, dealt with the Nation. After the Civil War the Fourteenth Amendment set that theory aside by declaring: "All persons born or naturalized in the United States, and subject to the jurisdiction thereof, are citizens of the United States and of the State wherein they reside." Every citizen now owes allegiance to the Nation as well as to the State. "A Citizen of America is a citizen of the general government, and is a Citizen of the particular State in which he may reside. . . . In Forming the general government we must forego our local habits and attachments, lay aside our State connections, and act for the general good of the whole. The general government is not an assemblage of the States, but of individuals." Profiting by the experience of our country, the United States of Brazil, which was established in 1890, after the overthrow of the monarchy, carefully provided, in a constitution closely copying the fundamentals of ours, for a "perpetual and indissoluble Union between former provinces into the United States of Brazil." And in 1900, when the various provinces of Australia were united as the Commonwealth of Australia, the Constitution, also closely following ours and adopting our terms, "State", "House of Representatives" and "Senate", provided for an "indissoluble Federal Commonwealth"
3 Since the Ethical and Moral Purpose of our Constitution is to "establish Justice" to insure domestic Tranquility, guidance from moral principles such as equality before the law, the absolute right to petition for redress of grievance without resort to violence against human dignity and liberty, are constituents of "Justice", and necessary to interpret it. The governmental "judge" made doctrines of Sovereign Immunity and Judicial Supremacy inculcated over the last years of judicial incrementalism are untenable to the Constitution as written. Sovereign Immunity changes the basic relationship between government and its people from one seeking moral justice under the law to one in which people have no enforceable rights and government has no enforceable limits. That concept of moral justice; of striving to establish Justice and domestic Tranquility is what distinguishes barbarian from civilized society. The Founders designed the Constitution to transform the barbarian rule we rejected as Colonies, into a civilization befitting the dignity of a free people. The Constitution, by both its general design and its terms as written, limits government to the powers delegated. Immunity from accountability to these limited powers it injures in violation of the law is a power not delegated. The Tenth Amendment forbids it. Our Constitution is a closed legal and logical system that declares itself and the laws made pursuant to it, to be the supreme law of the land, and that is the only law that it allows. There is no room in it for "inherent sovereign immunity". With respect to Supremacy, "The Supreme Law of the Land" is "The Constitution as it is written" and the laws made pursuant thereto. Its interpretations are not the supreme law of the land. They are mere interpretations that may or may not be correct, or may even be dishonest and treacherous to it. The final arbiter therefore of the meanings of that Supreme Law can only be We The People through utilization of the amendatory processes contained therein, and through the absolute First Amendment Right of Petition for a Redress of Grievances. Under the Articles of Confederation the expenses of the common defense were to be "defrayed out of a common treasury" supplied "by the authority and direction of the legislatures of the several states." The Nation itself had no power of self-defense in the raising of money and in some other important respects. It turned out in practice that some of the States signally failed in emergencies to make their contributions to the "common treasury." Indeed, only New York and Pennsylvania paid their full proportion of the costs of the Revolution. One State, which had suffered none from the ravages of war, contributed nothing. But (to illustrate the difference between a league of States and a Nation) when the United States entered World War 1 in 1917 the Congress promptly exerted its power under the Constitution and raised by the issue of Liberty Bonds, by income taxes, and by other means all the money that it needed for "the common defense." The States as such were not concerned except in providing militia, a subject to be noticed later. So it had been in the War of 1812, in the Mexican War, in the Civil War, and in the War with Spain. The Articles of Confederation were wholly deficient in this most important of all respects, in the power of "common defense." 4 Comment has been made that God is not mentioned in our Constitution. In the Declaration of Independence "firm reliance on the protection of Divine Providence" is expressed, and in the Articles of Confederation it is mentioned that "it has pleased the Great Governor of the world to incline the hearts of the legislatures we respectively represent in Congress to approve and to authorize us to ratify the said Articles of Confederation and perpetual union." The Commonwealth of Australia put in the preamble of the Constitution which it submitted to the English Parliament for approval (1900) that "Whereas, the people of New South Wales, Victoria, South Australia, Queensland, and Tasmania, humbly relying on the blessings of Almighty God, have agreed to unite," etc. 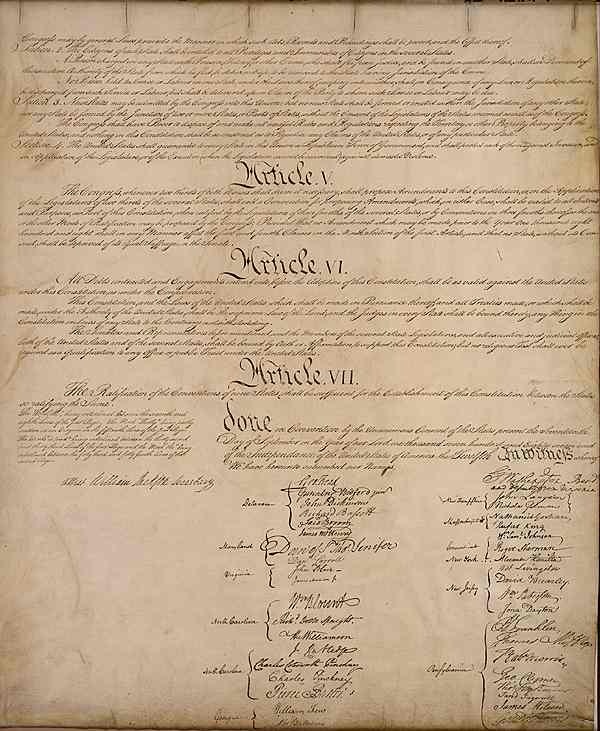 Footnote [A]: It is important to note that the words "Constitution for the United States", "The Preamble" and the dates of adoption and effectivity do not appear on the Original Document. 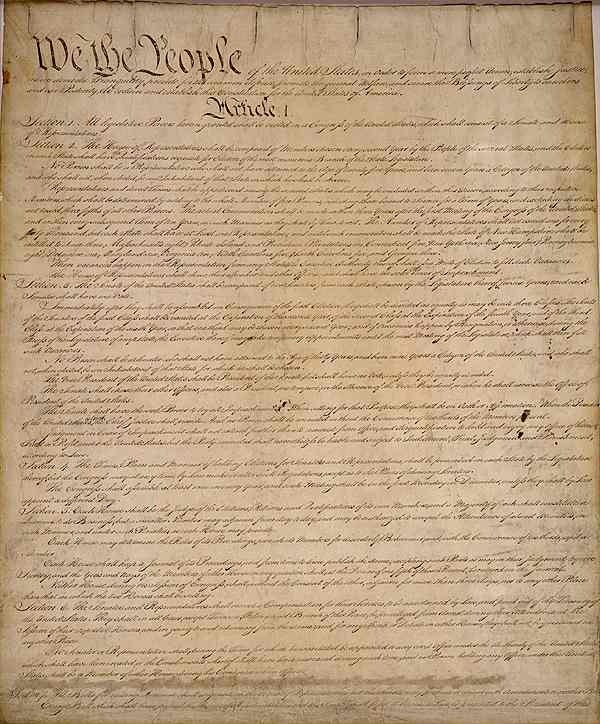 That document begins with the words "We The People" in much emboldened characters to emphasize that it is the People that are establishing this Constitution, followed by text in lesser case characters, "of the United States", to further denote the Body of the Whole in Common Law. The aforementioned heading has been added to textual presentations as a document title for cataloging and reference purposes. It has no other purpose and neither carries nor implies any authority. I have very deliberately titled this work "The Constitution for the United States" to re-iterate the wording of clause four of the "Preamble" ,i.e., "promote the general Welfare, and secure the Blessings of Liberty to ourselves and our Posterity, do ordain and establish this CONSTITUTION for the United States of America" and to emphasize that this is a charter that "We the People" have given to the united States, and not that the States or the National Government has given to "We the People". It is "We the People", the Sovereign Citizens, who must, through our efforts and responsibilities, secure this Charter of Liberty, Freedom and for Responsible Government for All Future Generations. The authority of government lies entirely and irrevocably within the Body of The Whole, "We The People". An additional link to "The Flags of the Several united States" with links to State Homepages and images of each of the Flags of the Several united States and the Territories.